Good to know. I’ll try harder. Good luck, can’t wait to see it published and in a bookstore. I side with your editor too. I often do this nasty test on books. Open the book in the middle and start reading from a random page, if I can’t follow or don’t like the book, I may conclude the book is not for me. And then I sometime do the “When Harry met Sally” thing by jumping to the last few pages of the book and read to see what the author’s final thoughts are. Again, same criteria. Here we are, polishing our narrative, making sure that it builds, that no element is out of order, and then …. you open at a random page. oh dear. i do the same thing kempton does 😦 open the book at a random page, usually looking to see if i can stand the writing style. which is why i have never added a penny to a certain jkr’s writing fortune. yet my son owns the c.s. lewis chronicles of narnia series. peter g. has a lovely writing style on his blog… the narrative only appears half way down with a twist. who will make it half-way down if they can’t stand the tone? In my experience, pointing a Glock at the reader’s temple works pretty well as far as getting him or her to read at least halfway down, irrespective of whether or not they can stand the tone of my writing. After that, the clicking sound of cocking the gun usually helps to make them finish the piece. Ha ha Andreas, sorry for scaring your. You see, the randomness in the page ensures the author’s book has good stuff semi-uniformly across the whole book. dafna, I’ve read all 7 of jkr’s book and this is the secret of how I do it. I think in the last few books, I ended up skipping a large part of the descriptive parts and go straight to the dialogues between the people I care about. I’m sure it’s the best third draft you’ve submitted so far. You are cheeky, cheeky, cheeky. I hope for your sake that you won’t need to revise your manuscript any more. Regarding the comments by Kempton, Dafna and others, I, when picking up a book in a bookstore whose cover or title has taken my fancy, usually peruse only the first page of the opening chapter. This is usually enough to tell me if the book is my cup of tea. Which is why I’ve yet to read a book by Dan Brown or Stephen King. Dan Brown I can understand but you may have missed out on Stephen King. Still, he does start out poorly (in my opinion) and takes his time in capturing the reader. My method on choosing books is read the blurb on the inside jacket cover then the first page and then, if I am still undecided, choose a random page from the middle and read a paragraph. A slow process at times. Belated, but hearty, congratulations…. 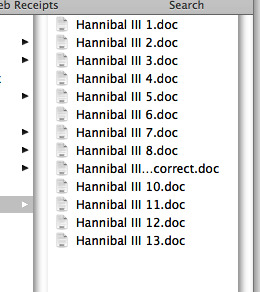 have not been here to the Hannibal Blog for some time and am enjoying catching up. Thanks, Chrissy! I’m about to get this draft back now. Going very quickly now. My editor in NY said we’re weeks away (from the final manuscript, not from publication).